Apps seem to rule each and every facet of our lives. From accomplishing your fitness goals to enjoying retail therapy from comfort of your house, there is an app for every conceivable thing. Recently, Google came up with a travel mobile app known as Trips. This new app is akin to your trip planner as well as travel guide. This handy app will guide you in your pursuit of exploring a brand new place. Google Trip is available free of cost on both Android and iOS platforms. From organizing your plane tickets to getting your hotel reservations, the app offers editorial guides to almost 200 cities across the globe. It provides personalized recommendations to the users on the basis of their Google history. What’s more it even works offline. This means you can download whatever you want on to your smart phone prior to stepping out of the Wi-Fi zone. You can download maps, walking directions etc. So, basically you get to save on money which you would have required to pay in case you made use of your expensive international data plan. 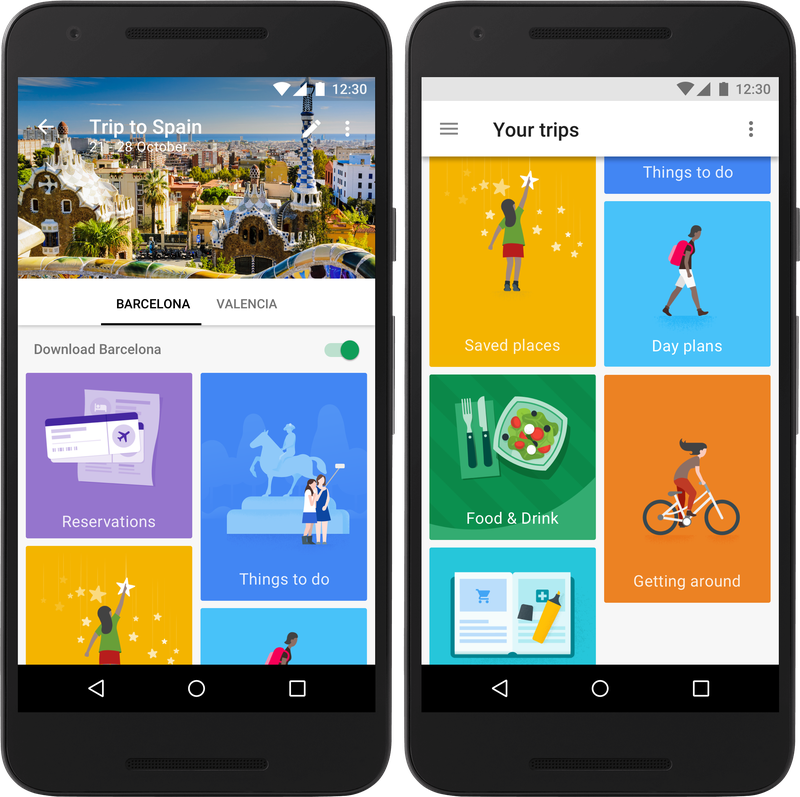 Google Trips is your personalized travel guide. It encompasses various categories of information such as your day plans reservations, things to do, food & drink etc. All this information is available right at your fingertips. All you need to do is log on to your Google Account. After signing in, you will get a list of your forthcoming and previously completed trips. Whatever trip you like, you click on the ‘Download’ button which is placed under each trip and then save the information to your phone. The app enables you to organize your hotel, flight and even car rental booking. Google Trips allows you to select your own adventure. It shows you a wide range of day plans. These days plans are actually the most sought after daily itineraries, for across top 200 cities across the globe. What Google has done for convenience of the traveler is truly amazing. It has automatically brought together the local gems, the most visited attractions, and sights, into a one day city tour. This is done as per analysis of visits by other tourist. For example, in case you are visiting Paris. You can pick up any multiple day plans such as “Eiffel Tower”, “Musee du Louvre” etc. You just have to tap into a future trip and you will get to know about wide range of choices available for you. Reservation tab organizes your hotel and flight information. It also handles any rental car reservations which you have made. Then there is “Need to Know”. It has important information regarding how you can reach center of the city from the airport, the local currency, and what all you should do in event of an emergency. Another option is ‘Things to do’. It creates custom itineraries as per your duration in a particular town, well known destinations, and anything which you have starred previously or have saved on the Google service. You can also pick up a general itinerary such as “72 hours in New York” or delve deeper into guides, which lay emphasis on museums, shopping or other activities. In case you have active cellular connection, Trips will draw in real-time information as regards which destinations are open or close. It can even make adjustments on basis of time of day or weather at a particular place. For instance if it begins to rain it will suggest you places where indoor activities are available. Why do I need Google Trips? We all need a break from monotony of our daily life. Demands of family, work and children put a burden on us. This has propelled a need for a vacation like never before. But then planning a vacation is also not easy. You have to organize for so many things. You can actually become confused for choice. You will get recommendations from online sites, your friends and professional travel guides. But then figuring out how you can squeeze all in a trip can be quite stressful. So, with the aim to minimize the hassle of travelers and help them enjoy their truly deserved vacations, Google has come with an amazing travel mobile app i.e. Google Trips. This app enables the users to plan each and every day of their trip without much effort. How can you plan each day of your trip on Google Trip? People face different time constraints. They might even have different interests. This means that there is no itinerary which is good for all. So, Google plans each day of your holiday as how you want. For instance, you go to Agra and like most of the people you go to see the Taj Mahal. Now you want some suggestions for things to do near that spot. In such a case, you have to click on the “+” button in your day plans tile. This will take you to a map where you can view other top attractions in the place you choose. If at all you are pressed for time, you can specify the same above the map. You can mention that you have just morning or evening, in comparison to a full day. Then you have to pin the Taj Mahal in order to create an itinerary around it. It can be an ordeal to have all your travel information scattered across different apps. Now Google Trip is your all in one travel mobile app where you can have all your travel information be it your hotel booking, flight booking, car rental, restaurant booking etc all at one place. Google Trips gathers your complete travel reservations from your Gmail account so that you do not have to continuously check your mails for any kind of information. You will have access to the information even when internet connection is not available. So, hands down this app is your ultimate travel companion.